The new baby hatchling peeks out into the daylight and breaks away from comfort of the protecting shell...A soft bed awaits and a pale little hatchling is ready to nestle....Nutmeg Hare's "The Hatchling" is a woolen of Spring... a new beginning, and a woolen of "I want" .... 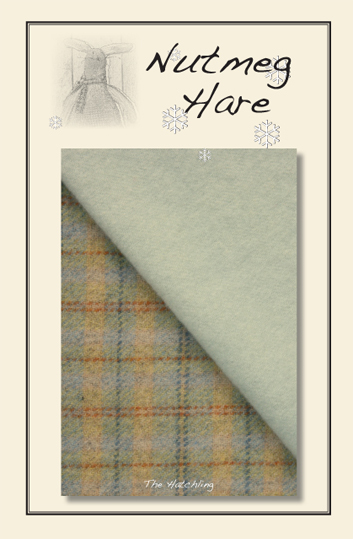 The primitive pastel tones of yellow and blue in a lovely plaid pattern with marmelade striping, are paired with a 100% solid toned woolen in a subtle shade of robin's egg blue with a hint of minty green. If Nutmeg Hare may add yet another favorite woolen to the list, then let the wish be granted and "The Hatchling" shall be added. As always, soaked in a wonderfully scented Eucalan bath and dried to luscious softness, this wool bundle includes two coordinating pieces in choice of either fat sixteenth (approx. 6" x 17"ea.) or fat eight (approx. 12" x 17" ea.) sizes. Sometimes the more neutral tones of woolens can be even more beautiful than the "pretty" colored woolens...although Nutmeg Hare truly loves them all. "Barefoot in the Sand" is indeed earthy, somewhat neutral, but without a doubt...simply beautiful. 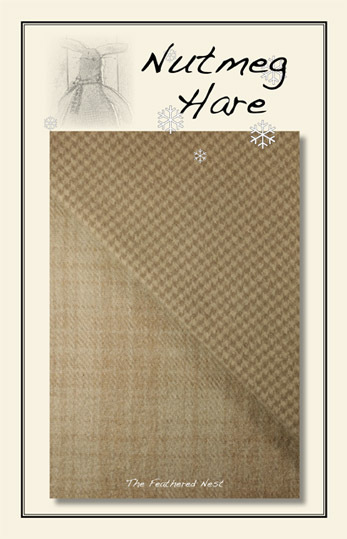 Combining a textured bisque colored 100% woolen with a tiny windowpane pattern and a lovely solid pale shade of sand, you will definitely be in "wool heaven" with endless possibilities for your woolen bundle. As always, soaked in a wonderfully scented Eucalan bath and dried to fluffy softness, this bundle includes two coordinating pieces in choice of either fat sixteenth (approx. 6" x 17"ea.) or fat eight (approx. 12" x 17" ea.) sizes. 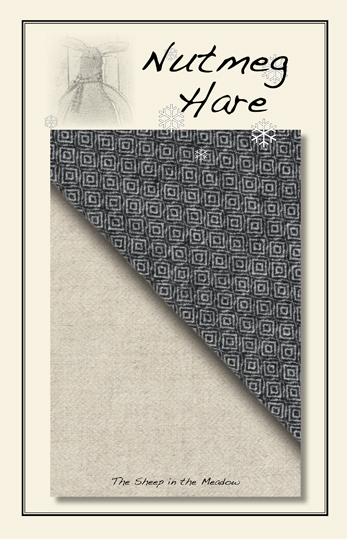 "Simple Ways" for simple days...This lovely 100% hand dyed woolen bundle is a simple gray to simply love. Whether you are stitching the donkey in Nutmeg Hare's "Sweetest Miracle" design, a flock of sheep grazing in the meadow, or perhaps Spring time garden tools... "Simple Ways" is a woolen to admire. This soft and needful two piece bundle is a lovely combination of a peaceful solid gray piece along with its heavenly soft and darker houndstooth counterpart. As always, soaked in a wonderfully scented Eucalan bath and dried to fluffy softness, "Simple Ways" wool bundle includes two coordinating pieces in choice of either fat sixteenth (approx. 6" x 17"ea.) or fat eight (approx. 12" x 17" ea.) sizes. Hand dyed woolens are irresistible to Nutmeg Hare. There can never be enough, thus we will just continue to add to the choices. 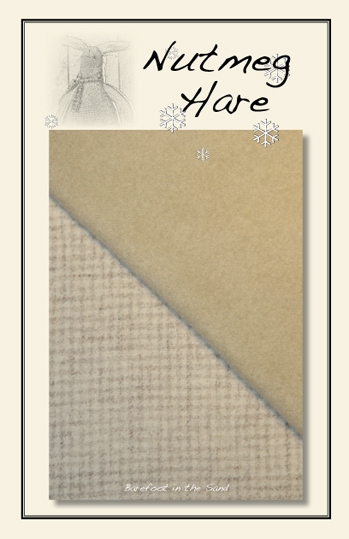 This brings us our new selection of woolie softness in "The Feathered Nest"....a beautiful 100% woolen bundle with an antique overtone. 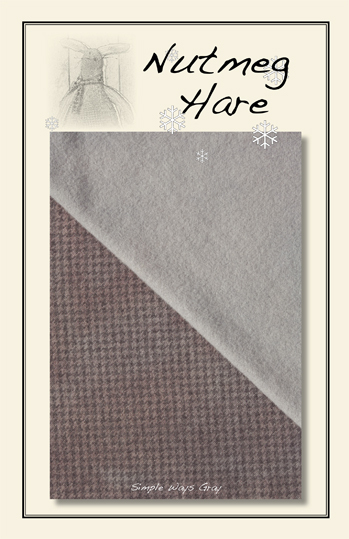 Hand dyed on a lovely houndstooth woolen and coordinated with an equally lovely plaid piece "the feathered nest" woolen is brought to life in our nibbling bunny from "Carrots on the Bunny Trail." As always, soaked in a wonderfully scented Eucalan bath and dried to fluffy softness, this wool bundle includes two coordinating pieces in choice of either fat sixteenth (approx. 6" x 17"ea.) or fat eight (approx. 12" x 17" ea.) sizes. Snowballs and Lilacs...".Oh the pretty flowers, coming ere the Spring time to tell of sunny hours"... The old-fashioned snowball bush with its huge flower clusters, and the aromatic scent of the lilac that matches only its beauty come together in this gorgeous bundle. Imagine this as your Spring time "woolen" bouquet in a basket. 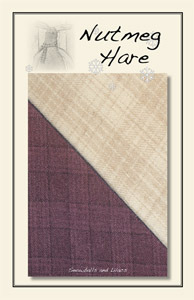 The felted plaid 100% creme with subtle beige piece paired with the hand dyed rich purple woolen are worthy of a stitcher's treasure trove. As always, soaked in a wonderfully scented Eucalan bath and dried to perfect softness, this wool bundle includes two lovely pieces in choice of either fat sixteenth (approx. 6" x 17"ea.) or fat eight (approx. 12" x 17" ea.) sizes. "The Sheep in the Meadow" is just one of those woolens that you can not help but love. The softness and texture of the charcoal on creme piece and its primitive ivory wool partner is one to dream about ...I see a group of sheep in the making...a dark sheep here...a light sheep there...I see a primitive Santa's beard of ivory...I dream to see.....Soaked in a fine wool wash and wonderfully scented Eucalan bath, then dried to the soft touch we love about wool, this felted bundle includes two coordinating pieces in choice of either fat sixteenth (approx. 6" x 17"ea.) or fat eight (approx. 12" x 17" ea.) sizes.